If you think it looks like somebody stuck their finger into the middle of that cake to lick out the filling, you would be wrong. If you think I was corny enough to put two lemon candles behind my lemon cake, you would also be wrong. If you think I cut cakes really sloppy and bad, you would be wrong as well. If you think I rent Twilight about once a month to watch it in secret, you would be very wrong. What's this called? Being a compulsive liar or something? Okay, enough lies. Here's a truth: THIS CAKE IS AMAZING. Also, Twilight is hilarious. It makes me feel good about my life. Seriously though, I was not in the mood for cutting pretty slices of this yesterday. But don't judge by my bad cutting skills. This is truly a fabulous cake. First of all, I think I've created the best white cake ever. Then I layered it with lemon curd and whipped cream. I made this for my Grandma's birthday. It was supposed to be so beautiful. I guess I was just not in the mood for decorating. I mean, three lemon halves? How lame. I'm sorry. Just make it beautiful for yourself. Here's the recipe. Preheat oven to 350ºF. Grease four 9 inch cake pans and line with parchment paper (you can do it in 2 cake pans if you want, you'll just have to bake it a little longer and you'll have to cut them in half if you want the four layers). Beat the egg whites with the cream of tartar until soft peaks form. Add the 6 tablespoons of sugar and beat until stiff peaks form. Set aside. (I do this first because the beater has to be clean for the whites and this way I don't have to clean it in between). Beat the butter and remaining sugar until fluffy. Mix in the milk and extracts. It might get kind of lumpy and separated, but don't worry. The flour will bring it back together. Sift in the flour, baking powder and salt a little a time, mixing until smooth. Whisk in about a fourth of the egg whites to lighten the batter and then fold in the rest. Pour into prepared cake pans. If you're doing it in four cake pans, they'll probably take about 15-20 minutes to bake (I only bake two at a time) or until a toothpick comes out clean (a small crumbs attached is okay). DO NOT OVERBAKE. It will get really dry and gross if you do. For two cake pans you'll want to bake it just a little longer. Except your stove will probably be cleaner that that. 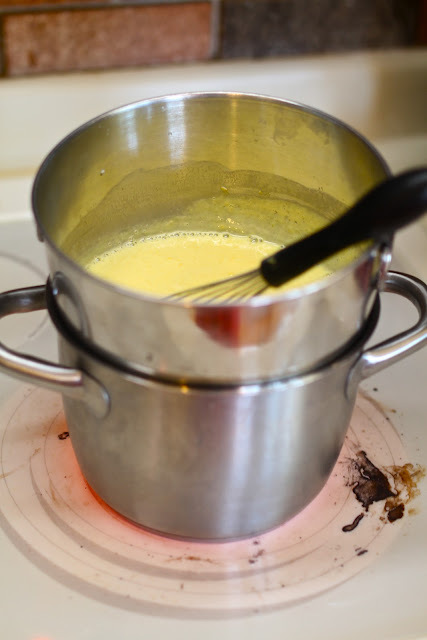 Whisk until it begins to thicken (until it coats the back of a spoon) and the whisk in the butter. It will thicken as it cools. Cool it completely in the refrigerator before assembling the cake. 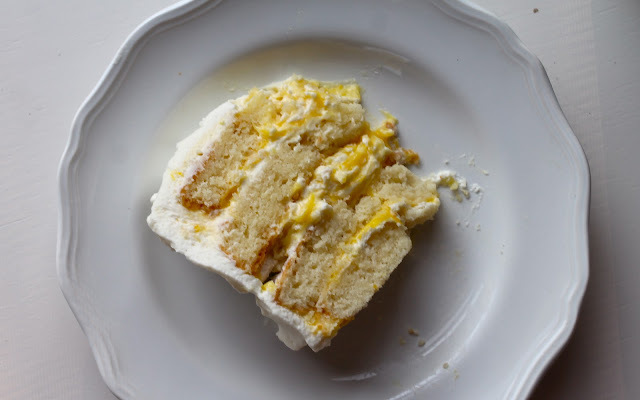 To assemble, layer each layer of cake with with whipped cream and lemon curd and then frost the whole thing with whipped cream. I whipped up about 1 1/2 pints of whipped cream and sweetened it with a handful of sugar. Check me out on Facebook if I haven't scared you away yet.